It is now the time of year dedicated to planning and preparation for the gardening year ahead. It is important to start thinking about what you want to grow next year, and to get your seeds and bulbs ordered. It is equally important to have a plan of attack ready for the pests that pose a threat to your lovingly grown crops throughout the coming year. Nematodes offer a biological solution to pest control, and the various species grown by BASF in the only specialist nematode production facility in Britain, can protect your vegetables, fruit, flowers, shrubs and trees from a variety of pests. BASF offer six different products, which you simply mix with water and either apply from a watering can with a coarse rose or sprayed onto the foliage and soil, depending on the variety. There is no need to keep children or pets away from treated areas and the whole programme is entirely biological so that all the Nemasys products can be used by organic gardeners. All Nemasys products can be ordered online, with an entire season’s worth being ordered and sent out as and when needed. This means that all of your planning can be done now, and you can concentrate of planting and growing, safe in the knowledge that your pest control is taken care of. The British climate is the perfect breeding ground for slugs, and it is no wonder that this slimy beast regularly tops the ‘most hated pest’ lists. There are usually two overlapping generations of slugs in the garden, with peaks of egg laying in March – April and September – October. With each slug laying up to 300 eggs, in up to 50 separate batches, it is estimated that each cubic metre of soil can contain around 200 grown slugs! The best time to target them is when they are newly hatched, so the period between March – October is ideal. As nematodes are able to travel through the soil, to where the newly hatched and young slugs dwell, they are able to attack them before they are even in sight, unlike slug pellets. A regular regime of using Nemaslug every six weeks throughout this period is the most effective way to keep slugs at bay throughout the growing season. Vine weevils are beetle with a long, thin snout. It is actually the larvae of the weevil that causes the main damage to plants, as they remain in the soil and eat the roots. 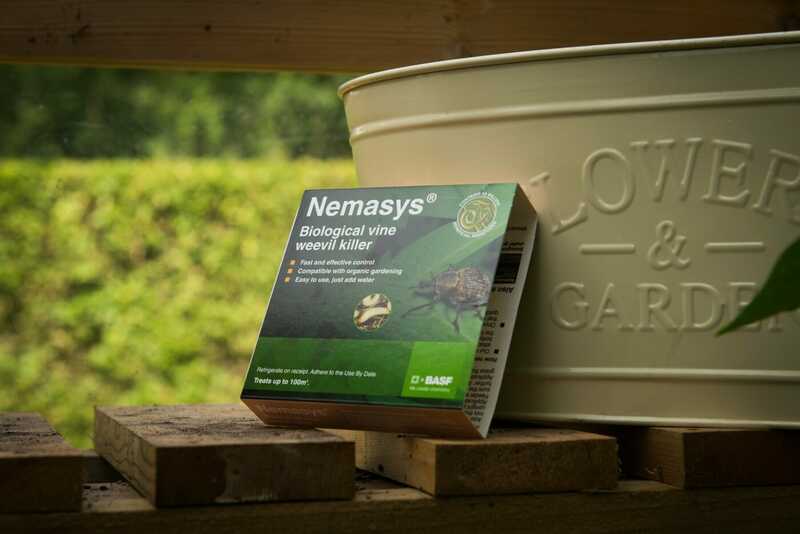 Nemasys Vine Weevil Killer targets the larvae while they are still in the soil, and kill them before they have a chance to cause damage. A regular regime of using Nemasys Vine Weevil Killer every four weeks throughout the growing season is the best way to keep the pets at bay. Chafer grubs are creamy coloured, about 15mm in length, and have distinct legs. Chafer grubs burrow deep into lawns during the winter, where they lie dormant before surfacing in the spring as beetles. The grubs attack grass roots, resulting in slow growth and yellow patches, with grass being easy to be pulled up with little or no root. Wildlife such as birds, foxes and badgers can also create damage by digging the turf to search for the grubs. If Nemasys Chafer Grub Killer is applied between August and October, it dramatically reduces the chafer grub populations. Leatherjackets are about 25mm in length, with greyish black, legless bodies and no distinct head. They are the larval stage of the crane fly, which appears towards the end of August and lays eggs which hatch within two weeks and immediately start to feed on grass roots. It is best to apply Nemasys Leatherjacket Killer when the leatherjackets are still young and active in the soil, throughout late August to the end of October. Black, red and yellow ants can all be found in gardens. Yellow ants build unsightly nests in lawns, red ants are aggressive and can sting if disturbed, and black ants can nest anywhere, forming nests of up to 7,000 ants! Applying Nemasys No Ants to their runs and nests during the peak months of April – September drives ants away from the area.